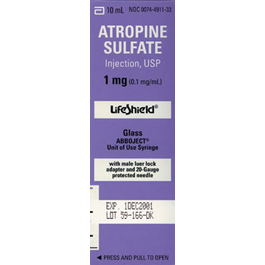 NOTE: Atropine is also one component of the Mark 1 kits or as a Duodote (in with the HazMat Drugs in GMVEMSC Drug Bags). Organophosphate or Nerve Gas poisoning: 2 mg IV, IO or IM every 5 min OR Mark 1 Kit item one, or Duodote until lungs are clear to auscultation. There is no max dose for Atropine for Organophosphate or Nerve Agent poisoning. There is no max dose for Atropine for Organophosphate or Nerve Agent poisoning. None for severe organophosphate exposure. Tachycardia, paradoxical bradycardia when pushed too slowly or when used at doses less than 0.5 mg, palpitations, dysrhythmias, headache, dizziness, anticholinergic effects (dry mouth, nose, skin, photophobia, blurred vision, urinary retention, constipation), nausea, vomiting, flushed, hot, dry skin, allergic reactions. Atropine causes papillary dilation rendering the pupils nonreactive. Pupil response may not be useful in monitoring CNS status.